Saturday's opening session typically revs things up prior to the 3A family coming in. The Shirk Center certainly rocked the crowd from the morning to the afternoon with tons of outstanding performances. The theme of the meet was set rather quickly once the track prelims started. The fuss over freshman Kaleb Brown was real. A football standout from Chicago St. Rita who already has college coaches drooling over him. But as the gridiron types soon find out, track & field is a different beast. Brown ran 7.13 in his 60m heat which is OK but not great. But he put the brakes on his follow through prematurely. Be as it may Brown advanced to the final and would have to face standouts such as Brailyn Johnson (Jr., St. Laurence), Ryan Curington (Sr., DeLaSalle), and Finnigan Schirmer (Jr., Marengo). Brown broke out of the blocks with a good start and motored home with the big win and a personal best 7.01. 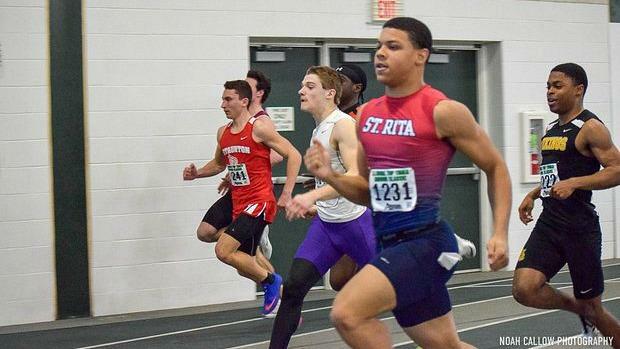 Later his teammate Mick Doyle (Sr.) anchored the Mustangs to a thrilling win in the 4x200 (1:33.36) and took the 200 in 22.56. Schmirer won the 60H in 8.30 over Jaden Johnson (Sr., Freeport) who came as the top seed from the prelim. Defending 400m champion Davon Bolden (Sr., Thornridge) was eager to get back on the track after his team had a bad experience in the 4x200 which led to a disqualification. Bolden bolted away from the field late in the final stages to win in 50.47. In just his second race of the indoor season, Mathias Powell (Sr., Mahomet-Seymour) burned the field in the 3200m with a school record 9:13.79 and IL#4. Powell and Garrett Dixon (Sr., Monticello) waged a battle for a good portion of the way, but Powell was too strong down the stretch. Riley Wells (Sr., Rockford Christian) mowed down the field on the final lap to win the 800m in 1:59.63. The emerging Brooks Harlan (So., Centralia) made his mark in the 1600m by bolding frontrunning from the early going. Dixon gave chase inside of the last quarter-mile but could not reel in Harlan who won in 4:27.41. Dixon clocked 4:29.29. The 4x800 came down to two teams: Rockford Christian and Dixon. It was all over once Riley got the baton on the anchor and put the race out of reach for the Royals 8:16.14... Burlington Central snatched the 4x400 victory from hands of Eureka 3:32.04-3:32.68. Zach Pluff (Sr., Freeport) won the high jump with a leap of 6-6, just ahead of David Emuze (Jr., Springfield Southeast) and his 6-5. Back in action after pulling his hammy in February was the previous state triple jump leader Andra Ward (Sr., Cahokia). Ward beat a solid field to win with a season-best 47-4.5... Chandlar Ifft (Sr., Prairie Central) won the pole vault over a foot with a 15-6. The new "workhorse" title has to be given to Serena Bolden (Sr., Springfield Southeast) who once again competed at the zenith of her ability in four events. Steadily getting better each weekend, Bolden got things started in the long jump pit. Only taking two attempts, Bolden connected on a 19-9.5 winner and class record. Bolden was not done as she moved to the track to run her 60m prelim. She would post the fastest overall time to the finals with a 7.68. Later on, Bolden would be officially confirmed the long jump champ and then dominating the field in 7.65. But hold on! Bolden would grace the track one more time with her teammates. The Spartans were seated first in the 4x200. Bolden led off with a 24.8 split and her mates did the rest racing to a meet record 1:44.94. Bolden closed out her day with a big win in the triple jump 39-11.75. Sam Spencer (Jr., Providence Catholic) won the pole vault at 12-6, but the state leader wanted the bar raised to 13-feet. Spencer is confident in her belief that she can challenge the state all-time best outdoors if the weather conditions are ripe. Last year's high jump champion Diamonasia Taylor (Jr., Urbana) was ready to repeat as champion a month ago. But an unfortunate accident while long jumping produced a damaged wrist that severely impacted the way she jumped. Taylor admitted that falling on her prevented her from going all out. However, there was no sympathy cry from Carly Tucker (Jr., Metamora) who won with a 5-6 clearance... a close battle between three shot putters was ultimately won by Jayden Ulrich (So., East Alton-Wood River) with a 42-5.5 effort. Top Times is usually the wake call meet for central Illinois kids. It's no different for Emelia Ness (Jr., Monticello) who ran the same time last year but got the win this time. The 9.03 clocking was IL#6 and will set her up nicely for the outdoor season. Of the three races that Jayla Campbell (Sr., Rich Central) competed in, the 400m would be the one that she would dominate. Campbell put away the field early and won in 57.66. Campbell would later place third in the 200 in 25.92. After being content with taking second to Bolden in the triple jump with a leap of 39-4, Tiera Robinson-Jones (Jr., Evergreen Park) got her first win in the 200m, holding off Seven Hicks (Jr., Peoria Richwoods) by an eyelash 25.29-25.30. In the 3200m, Jenna Schwartz (Sr., Waterloo) virtually led from the gun which featured the first mile in 5:25. Schwartz would not be threatened as she continued her dominance in winning with a time of 11:10.84. Lydia Roller (So., Staunton) held off Jordan Harmon (Sr., Unity) 11:117.94-11:18.36. It was said by a few people that Payne Turney (Jr., Clinton) was a huge threat in the 800m. It turns out they were right as she sped off to a 64.5 first 400. Turney was clearly going for Karina Liz's (Aurora Central Catholic) meet record. 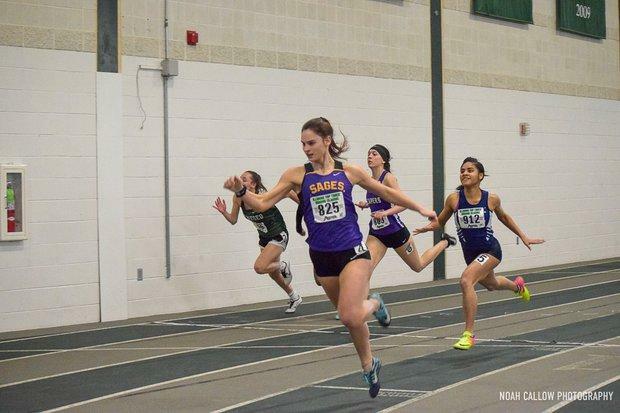 Although she came up a few ticks shorter, the 2:15.59 was very good and closes the season as the #7 time in the state... and Turney returned to win the 1600m to win in 5:07.07. Olivia Rosenstein (Jr., Urbana) missed out on the cross country season with a stress fracture. She was relieved to have challenged Turney and placed second in 5:09.01. Only one 4x8 unit had broken 10:00 before this weekend. After the race, it was four. Eureka led the way with an easy win in 9:45.28. The Rosary 4x4 finally got the right connection to click on the season's biggest day by winning in 4:10.37.